It's a sad day today. After a long fight with deteriorating health, a family friend has passed away today. It's always hard to know what to say to the surviving family members, but even though the message was simple, hopefully the thought that went into these cards brightens up their day. From our family to yours, we're so sorry for your loss. I completed the first card from my family & the second one for the in-laws. I have added rhinestones to the centers of the flowers in both cards, but they don't really show up very well in the photos. The first card, I have stamped directly onto the card. 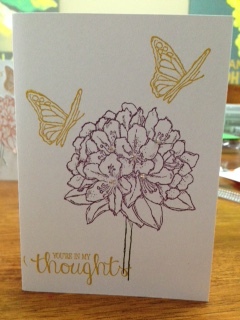 I used the Hello Honey ink for both the sentiment & the butterflies. I like how it's almost gold in colour. In the second card, I have stamped onto LWhisper White card stock then cut the flowers & butterfly out & glued them onto the card, slightly bending up the edges to give a 3D effect. 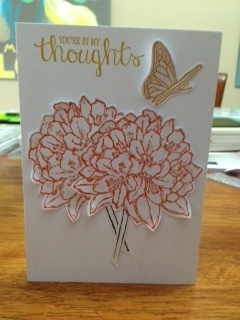 I have used Hello Honey on the sentiment & Delightful Dijon on the butterfly, which is more of a bronze colour, so it blends perfectly between the gold of the sentiment & the orange (Tangelo Twist) of the flowers. I hope they bring a little light to your day, too.